WIT Arena is located in the sunny southeast, in the beautiful city of Waterford. We have top-of-the-range equipment, trainers,facilities, and staff. 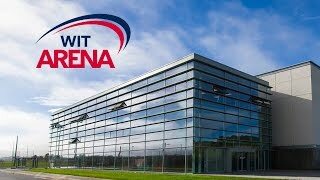 WIT Arena is the largest sports, conference and events centre in the South East of Ireland. The Arena is situated on the outskirts of Waterford, just off the motorway exit, which makes it easily accessible to immediate city and neighbouring counties. This multipurpose facility will cater for a wide range of events such as recreational gym users, high performance athletes, multipurpose sports, kids' activity camps, leisure and entertainment events and conferences. The facilities are state of the art and the service is truly exceptional. This stand-alone facility is also home to the largest sports hall in the South East which will host major events and conferences as well as multiple indoor sporting events such as basketball, soccer, badminton, volleyball and numerous other sports. It also boasts are "Edge Gym", high performance gym, fitness lab, fitness studios for over 40 different exercise classes along with three training (lecture) rooms for WIT Students attending sports' courses.